Photo Credit: Detail from Members of the Fresno Feminist Art Program at work in the feminist studio, 1970. Photograph by Dori Atlantis. Founding Alumnae of the Fresno State Feminist Art Program, 1970-71: Dori Atlantis, Susan Boud, Gail Escola, Vanalyne Green, Suzanne Lacy, Cay Lang, Karen LeCocq, Jan Lester, Chris Rush, Judy Schaefer, Henrietta Sparkman, Faith Wilding, Shawnee Wollenman, Nancy Youdelman, and Cheryl Zurilgen. DORI ATLANTIS is a Los Angeles-based photographer and installation artist. She often collaborates on public installations with another Los Angeles artist, Karen Frimkess Wolff, and attributes her penchant for collaboration to her experiences in the Fresno Feminist Art Program. As the unofficial photographer of the Fresno “feminist experiment,” Atlantis created a valuable record of the group’s activities during the 1970-71 academic year. She also served as photographer for a series of collaborative Costume/Performance images that prefigure Cindy Sherman’s famous Film Stills. Atlantis teaches art to visually impaired adults at the Los Angeles Braille Institute. VANALYNE GREEN is a video artist and writer whose work addresses the political implications of personal experience, and vice versa. Her earliest film, Trick or Drink (1985), about growing up with alcoholic parents, is widely used by Alcoholics Anonymous groups. In 2007, Green’s video, Saddle Sores: A Blue Western, was included in a series at New York’s Museum of Modern Art showcasing feminist work collected by the Chicago-based Video Data Bank. Green’s videos have been screened at venues around the world, including the Museum of Modern Art, the Whitney Museum of American Art, the Vidéothèque de Paris, and the Seoul Museum of Art in Korea. Green is Professor and Chair in Fine Art at the University of Leeds in West Yorkshire, England. After completing her BFA in fine art at the California Institute of the Arts, SHAWNEE WOLLENMAN JOHNSON pursued graduate degrees in nursing and psychology. She has worked for many years as a Registered Nurse and administrator for two Medicare Licensed Home Care Agencies in Northern California. Her mission is to implement strategies that will enable people to remain in their homes safely until the day they die. Johnson also continues to create artwork, and is particularly interested in combining digital images with fabric, wax and other mixed media. Some of her recent work incorporates heirlooms passed down from her birth father, a marine, who was killed in Korea when Johnson was two months old. Another recent series addresses the murder of her daughter-in law’s extended family in Kosovo in 1999. Johnson is passionate about raising awareness of the challenges facing women around the world. SUZANNE LACY is an internationally known artist whose work includes installations, video, and large-scale performances on social themes and urban issues. One of her best-known works to date is The Crystal Quilt (Minneapolis, 1987) a performance with 430 older women, broadcast live on Public Television. During the 1990s she worked with teams of artists and youth to create an ambitious series of performances, workshops, and installations on youth and public policy, documented by videos, local and national news broadcasts, and an NBC program. From 1987-97 she was Dean of the School of Fine Arts at the California College of Arts, and in 1998 she became Founding Director of the Center for Art and Public Life. In 1996-7 she co-founded the Visual and Public Art Institute at California State University at Monterey Bay with artist Judith Baca. Active in Oakland cultural politics, Lacy was a member of Mayor Jerry Brown’s education cabinet and an Arts Commissioner for the City of Oakland. Her work has been funded through numerous local and national foundations, including the National Endowment for the Arts and The Guggenheim, Rockefeller, Surdna, and Nathan Cummings Foundations. Also known for her writing, Lacy edited the influential Mapping the Terrain: New Genre Public Art, published in 1995 by Bay Press, a book that prefigures current writing on politically relevant performance art. She has published over 60 articles on public art. Lacy is the Chair of Fine Arts and directs the Graduate Program in Public Practice at Otis College of Art and Design in Los Angeles. KAREN LECOCQ is a sculptor and installation artist who has shown her work nationally and internationally. She teaches in the Department of Art at the University of California, Merced. In 2003 LeCocq was awarded a Medal of Honor by the Veteran Feminists of America for a major contribution to the Second Wave Feminist Revolution, 1966-1980, at the National Arts Club in New York City. LeCocq’s performance as Léa was a highlight of the 1972 feminist installation, Womanhouse, which introduced the public to feminist art and attracted coverage in Time magazine and other popular venues as well as nationally distributed art journals. Léa is the heroine of Colette’s novel, Cherí, about an aging courtesan who desperately resists the loss of her youthful beauty and her privileged—if scandalous—position in society. Nearly forty years after her initial performance, LeCocq will re-create the role of Léa at the artists’ reception for A Studio of Their Own: The Legacy of The Fresno Feminist Experiment. JAN LESTER MARTIN worked for many years as a newspaper designer and columnist. During the 1970s and 80s she exhibited witty, humourous installations featuring human-scale cats, at the Los Angeles Woman’s Building and many other California galleries and museums. Lester recently returned to making art, working primarily in collage. CHRIS RUSH created the iconic Scrubbing performance at Womanhouse (1972), and completed her BFA in fine art at the California Institute of the Arts in 1973. Rush is an elementary school teacher in Los Angeles, where she works to incorporate the arts into the daily lives of her students. In 2008 Rush was awarded a grant from the National Endowment for the Arts to participate in programming at the Los Angeles Music Center designed to enhance art education at the elementary level. FAITH WILDING is a multidisciplinary artist, writer, and educator. She received her BA (1968) in comparative literature from the University of Iowa and studied fiber arts with Walter Nottingham before co-founding the Fresno Feminist Art Program as a graduate student and informal assistant to instructor Judy Chicago. Ms. Wilding chronicled the genesis of the feminist art movement in southern California in her foundational text, By Our Own Hands (Los Angeles, 1976). Wilding’s work addresses the recombinant and distributed bio-tech body in various media, including 2-D, video, digital media, installations, and performances. She also cofounded and collaborates with subRosa, a reproducible cyberfeminist cell of cultural researchers using BioArt and participatory performance in the public sphere to explore the intersections of information and biotechnologies in women’s bodies, lives, and work. For more information on subRosa, see www.cyberfeminism.net. She has exhibited in solo and group shows for over thirty years in the United States, Canada, Europe, Mexico, and Southeast Asia, at such venues as the Vancouver Art Gallery; P.S.1, Bronx Museum, Whitney Museum of Art, the Drawing Center, and the Bronwyn Keenan Gallery, all in New York City; Museum of Contemporary Art, Los Angeles; Riverside Museum of Art; Ars Electronica Center, Linz, Austria; Documenta X, Kassel, Germany; The Next Five Minutes Festival, Amsterdam; the Singapore Art Museum; and others. Faith Wilding lectures widely both in the United States and abroad, and is the author of Domain Errors! Cyberfeminist Practices (Autonomedia, 2003) among other publications. Wilding was named a Guggenheim Fellow for 2009. Her work has also been supported by grants from the National Endowment for the Art (1987, 1995), the National Endowment for the Humanities, and Creative Capital (2002-05), among other organizations. Wilding is currently Professor of Performance at the School of the Art Institute of Chicago, and a member of the graduate faculty at Vermont College of Fine Arts. NANCY YOUDELMAN is a sculptor and mixed media artist who has been exhibiting since 1972. Youdelman entered the original Fresno Feminist Art Program with a background in theatrical makeup and costuming. In the feminist studio, she created a “costume room” that helped facilitate the program’s pioneering work in performance art. Subsequently, Youdelman began transforming garments into sculptures incorporating photographs, letters, and other evocative domestic materials. In Youdelman’s hands, clothing becomes a metaphor for the ongoing negotiations between the body and the culture in which that body is socialized, and an emblem of human presence and loss. Youdelman is the recipient of numerous awards including recent grants from the Pollock/Krasner and the Adolph and Esther Gottlieb Foundations. Her work is represented by Eight Modern in Santa Fe, New Mexico and the SFMOMA Artists Gallery in San Francisco. She currently lives in Clovis, California and teaches sculpture at California State University, Fresno. JACQUELINE DOUMANIAN participated in the first feminist art class taught by Joyce Aiken, who directed the program for twenty years from 1973 until her retirement in 1992. 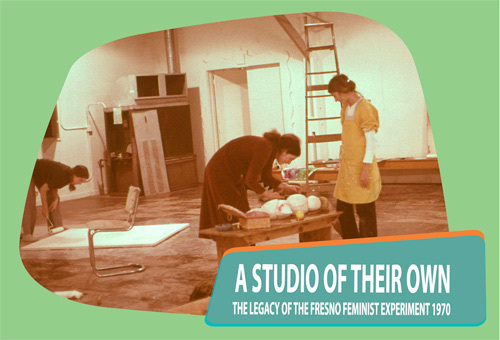 In 1974, along with Aiken and the other members of her class, Doumanian co-founded Fresno’s downtown Gallery 25 as a women’s cooperative exhibition space. Doumanian has taught studio art, as well as philosophy and yoga, at Fresno State and other California schools. Between the years of 1979 and 1992, Doumanian opened and operated her own retail business, Not Just Paper, in Fresno. She served as president of the local merchants’ association, was a business consultant, and held numerous public speaking engagements and workshops in relation to her business. She was honored twice as one of Fresno’s Top Ten Professional and Business Women of the Year - 1986 and 1990. Jacqueline is a leading advocate for the arts in Fresno. She designed and implemented an arts program for elementary schools for the City of Fresno, served as an active member of Gallery 25 for many years, and currently serves on the Board of Valley Public Radio and Fresno State’s College of Arts and Humanities. Doumanian is the Community Relations Specialist for CSU Summer Arts.